Searching for the Pulaski Historical Marker. Where to start describing how I visited the five foot tall granite 1936 Panola County Centennial Historical Marker for the defunct town site of Pulaski, former seat of Panola County? Here I am safely back in Carlsbad, New Mexico, re-reading Ruthie's directions to the marker. By way of explanation, Ruthie C, a septuagenarian retired Army Colonel who resides in San Antonio, is a trailblazer of the first order in locating these old historical markers. She did a lot of work hunting them down long before the current drive to inventory, locate, inspect, and photograph all these uniquely beautiful granite markers. Over one thousand of them were placed all over the state way back in 1936 in celebration of the Centennial of Texas' independence from Mexico. An awful lot of money and work went into planning, cutting, engraving, transporting and installing the 1,500+ pound granite slabs. The placement of these landmarks may have made a lot of sense back in 1936, but here we are over seventy years later and a lot of them are way, way off the current beaten track. After the project was finished, that department was closed and the markers largely forgotten about until just recently. Some have been moved due to development, more than a few vandalized, some lost due to incorrect placement, and some have been stolen. I have an idea some have even been disposed of in fills for interstate highway overpasses. And believe me, just because Ruthie was able to not only locate a marker but to actually get to it doesn't mean just anyone else is up to the task. I've thought about how to tell my story for several months now. What Ruthie wrote about how to find the marker may be correct, but meanwhile, there are a whole lot of blank spaces to be filled in along the way. 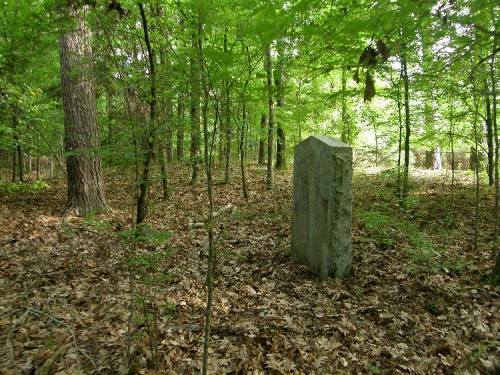 Quoting from her notes for visiting the Pulaski Marker: ". . . After going thru a cattle guard stay left at the Y. You will come to a cleared area for a pipe line, go left and follow the pipe line, cross fence, and follow it to the right, Marker is in a clearing on your left, There is some sort of a target near the marker." So, let me start at the beginning. This tale is going to take a while, so, relax, get a cup of coffee, and ease back in your favorite chair. 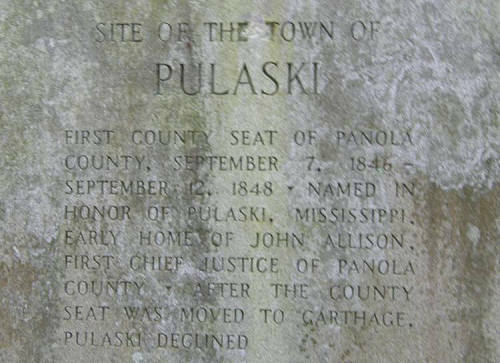 You may doze off a time or two, but that's okay because I am enjoying reliving my visit to the Panola County Pulaski Centennial Marker. To say this marker is off the beaten path is somewhat of an understatement. Sometime back in February I started planning a trip to see my friend and fellow TexasEscapes.com contributor, Gerald Massey, who lives in Shreveport, Louisiana. After visiting him, I wanted to see all the 1936 Centennial Markers I could on the way back home. First, Panola County, then Harrison, Upshur, Smith, Wood, Anderson, Navarro and Hill Counties. Just a few (40+) markers, don't you see. Anyway, back to my story. 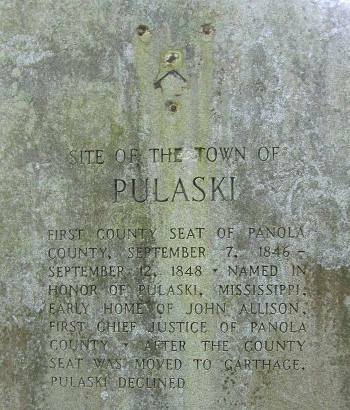 I talked with several people in Carthage, County Seat of Panola County, about seeing the Pulaski Marker. None had seen it themselves and few had ever even heard of it. Finally, I was given the phone number to the land owner on whose property the marker is located. I called him up. He was very friendly and told me that the marker was, indeed, on his property but that he had not seen it in over 35 years! It was way back in the brush right close to the Sabine River. He said, "I'm not a gonna cross that pipeline." With the recent rains, I pictured a huge mud and slosh filled ditch. He said it was very hard to get to by going through his property, and that I had best call his neighbor and get access that way. His neighbor said that his land had been reseeded several years ago by a forestation company, and the undergrowth was so bad that he didn't think you could get to it from his land either. I called the first guy back, and he was still very hesitant to take me to the marker. One thing led to another and the time to leave for Louisiana was at hand. I would have to 'wing' it. After visiting Gerald, I left Shreveport on Thursday morning, April 22nd. I ate a delicious breakfast at, of all places, the Petro Iron Skillet Truck Stop outside Shreveport. I then dropped southwest on US79 to see the Bethany Centennial Marker just inside the Texas State Line. Following Ruthie's directions, I located the unpaved Panola County Road and proceeded west with her notes in hand. I came to the "cleared area for a pipeline." Here is where you have to start filling in the blanks. The blank space between the word 'area' and the word 'for' is about two miles of back country, overgrown, uncivilized, desolate roads, undergrowth, thorns, and thistles. But I'm getting ahead of myself. When I came to the clearing, there was a locked gate. Some hunting club uses the property and has restricted access. I parked my truck so as not to block the road. Since it was still early in the morning, the dew was very heavy. I put on my boots, got Ruthie's notes, grabbed my camera, and climbed through the fence. 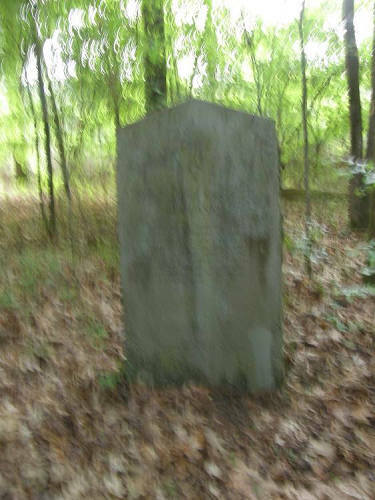 I even took a black and white print out of Ruthie's picture of the marker to give me an idea of its surroundings. I didn't know that I was filling in the blanks, so I expected a pipeline close by. I walked all over that area, all around the perimeter of the clearing as far away from the truck as I dared, and still didn't find anything. I must have read those notes 20-30 times. Complex directions always read different when you are on location. I looked left, right, and for another clearing. Nothing. 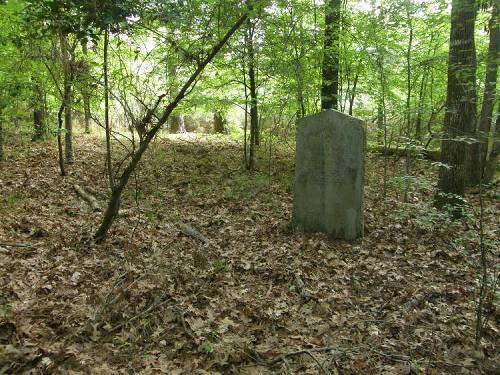 I imagined seeing the marker in clumps of trees, in a pasture, and back in the woods. Still nothing. Back to the truck I went. I read the directions again just to make sure I hadn't missed something, I turned around, and headed back down the road to civilization. Here came a pickup. 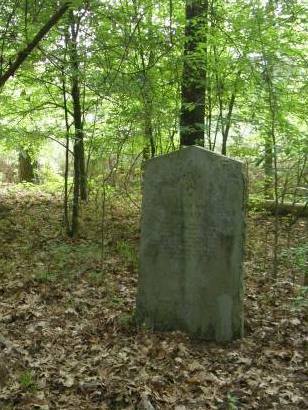 I waved it down, grabbed a picture of a similar gray Centennial Marker, and asked the man if he had ever seen the Pulaski Centennial Marker. He just grinned and began telling me how hard it was to get to. Turns out he was the nephew of the neighboring land owner that I had talked to. 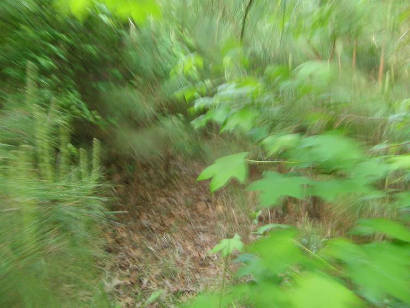 He told me it is quite a walk through thick undergrowth. I smiled and said that I was prepared for that adding, "I really want to see this marker." He said, "I'm not gonna go there but follow me and I'll show you how to get to it." He unlocked the gate and proceed far past the hunting lodge. We wound around for maybe two miles (filling in the blanks) where he turned off to the "left and follow(ed) the pipeline road" for about 100 yards. He stopped and pointed straight off the road. 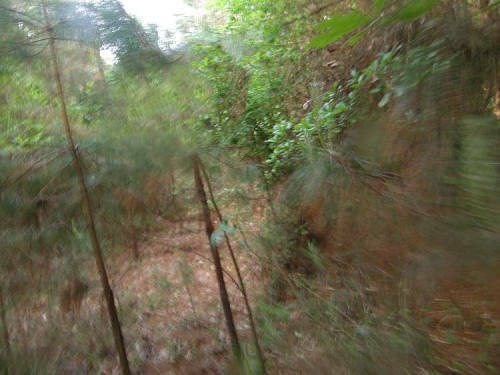 He said that the first part is thick with undergrowth, the reseeded forest, and at the property line, when it begins to thin out, is the old growth. The marker is right there. "Follow this fence line and it will lead you right to it." I saw that my cell phone had no signal and joked to him that if my truck was still there in a couple of days to come looking for me. He told me that he would not be back in that area for two weeks. Just in case he left before I did, he was kind enough to give me the combination to the lock so I could get out. 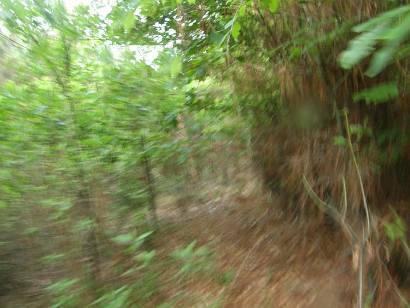 Seeing that it was going to be tough going through that thicket which was easily 15 to 20 feet high, I took only my camera. Right away I was besieged with thistle, thorn bushes, and clingy vines concealing all kinds of unfriendly critters. It must have been close to 1/4 mile when the undergrowth began to thin. Just as he said, the marker was right there. Relieved that I had actually found it, now my only thought was to get some pictures of the marker and find my way back. In hindsight, I was in such a hurry to get back to the truck and civilization that I didn't realize how much the sun was shielded for photography. I should have taken just a few more seconds to take better pictures, really look around, and maybe even go a few hundred more yards to the bank of the Sabine River but my only thought was OUT. I was just glad to get back to the truck in one piece. My arm and hand were bleeding from the barbs and scratches. I must have followed the fence line, but I never saw it the whole time. It couldn't have been twenty feet away. The time/date stamp on my pictures show that I was gone from the truck less than 15 minutes. It seemed like over an hour. On my way out of the property, the gate was still unlocked so I left a card telling the man, I don't even know his name, thanks for the help and for the directions. So, what is the location of the marker? I could give you my GPS readings but there are a whole lot of blanks to fill in between where you are right now and where that marker is.